“Somehow I just keep ending up back here,” laughed Lily Helfrich when commenting on her third summer working in a laboratory in Woods Hole. 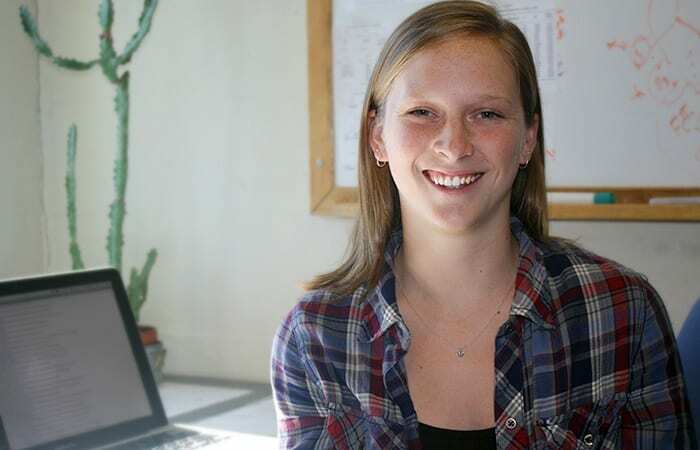 An early interest in biological sciences led the Falmouth native to work at the Marine Biological Laboratory for two summers before landing a spot in the Summer Student Fellow program at Woods Hole Oceanographic Institution (WHOI) in 2014. Coming off her junior year at Northwestern University, Helfrich spent the summer working with biologist Neel Aluru on Atlantic killifish (Fundulus heteroclitus), a fish abundant in coastal waters of the East Coast. The species is of particular interest to scientists because it can thrive even in areas contaminated with high levels of polychlorinated biphenyls, or PCBs, from past industrial activity. WHOI biologist Mark Hahn, with whom Aluru was a postdoctoral scholar, and his colleagues have been working to understand how killifish in New Bedford Harbor, which is contaminated with PCBs, have evolved genetic resistance to PCBs. Although genetic mechanisms (those that involve DNA sequences) are considered to be the major players in the development of resistance and other characteristics, in recent years, so-called “epigenetic” mechanisms which include non-coding RNAs have emerged as being important in determining various characteristics. Epigenetics refers to the study of heritable changes that are not caused by changes in the DNA sequence. Helfrich’s project focused on small, non-coding RNA molecules that have recently been shown to play an important role in epigenetic regulation. Helfrich analyzed a group of non-coding RNAs called microRNAs from killifish embryos from New Bedford Harbor and an uncontaminated creek on Cape Cod (Scorton Creek, Sandwich, Mass.). She used bioinformatic analysis to characterize different microRNAs in the killifish. By the end of her study, Helfrich identified changes in the abundance of some microRNA sequences in killifish that have adapted to high PCB levels. Her research was one of the first projects to do microRNA analysis in killifish. “This kind of analysis is going to be the future of biology, so it’s neat to have a hand in looking at some of this data,” she said. After Helfrich graduates in 2015, she hopes to take some time to travel before jumping into a graduate program. She is unsure of what field of biology she would like to study then, but her experiences this summer have broadened her horizons. Helfrich and her research were supported by The Arthur Vining Davis Foundations Fund for Summer Student Fellows.